People often turn to friends and family for help making decisions. The +1 button combines the power of these personal recommendations with the reach of Google, making it easy to start conversations and offer timely recommendations to your social circles across the Web. +1 recommendations now appear on Google search results, your Website, display ads, search ads, and now, your Google+ Business Pages. 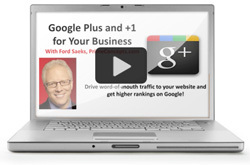 Join business growth innovator Ford Saeks as he reveals the insider secrets to leveraging Google Plus for YOUR business!